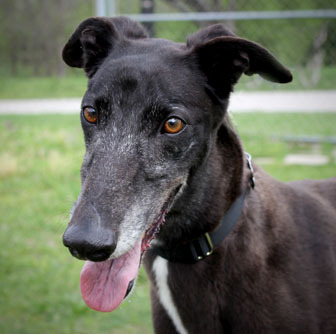 Ida, aka Ina's Ace, is a 6-year-old black female born April 17, 2006. Her sire is Oshkosh Slammer and her dam is Touche Baby. 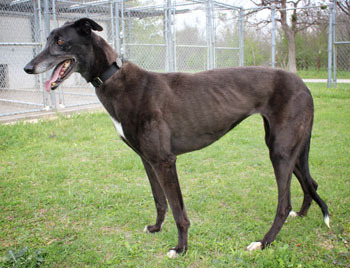 Ida has 22 races to her credit on Greyhound-data.com starting on November 24, 2007 and ending on August 30, 2009. 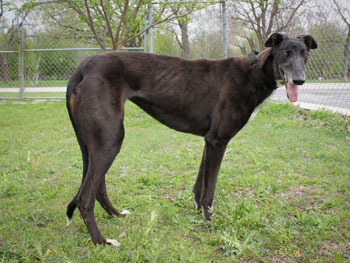 She raced at Orange Park in 2009 and at Derby Lane in 2007 and 2008. This little girl is ready to prance into your life with her cute white-tipped feet! Ida is not cat trainable - she was hunting the cat immediately. She is currently being treated for corns and is responding well. Ida is a very sweet girl who likes to be where you are. She is a roacher...and especially seems to like lying on her back up against walls...but will fall asleep just about anywhere. She is currently being treated for corns so she has not really run around a lot. However, she is a very "bouncy" girl who is ready to give you her affection. She is new to investigating toys, but is learning to play with them. She rides very well in the car and definitely knows when you are leaving the house as she gets excited hoping that she will get to go with you. She likes to be the first one out the door and the first one at your side so that she does not miss anything. She is very happy spending most of the day sleeping and usually positions herself where she can keep an eye on me. She is a bundle of happiness who wants to share it with a furever family!